Summer 2017 has definitely been a season of two halves, neaty deliniated by the start of the school holidays when everything went downhill! And as summer comes to an end there is still no sign of a spell of settled weather. I spent the first Saturday of June at the Welshpool & Llanfair Light Railway, as they were operating their vintage train with the replica Pickering coaches and a handful of freight wagons. Very picturesque. During the following week we endured some pretty heavy rainfall, strong winds on occasions and it was cool. I took a few pictures here and there on the Marches Line. The second week of the month started as the first had left off but as the week progressed it got steadily brighter and warmer. Colas ran another Neath to Washwood Heath stone train, but there was no timber from Baglan Bay to Chirk. Network Rail ran the HST test train down the Marches Line and I took my first shot off the new bridge at Caldicot of the Severn Tunnel. The following week started with record temperatures. My focus was on coal workings, Freightliner and DBC. On Monday afternoon in Neath the temperature peaked at 30C whilst I waited at N&B Junction for the 6E11 Onllwyn to Scunthorpe to appear. 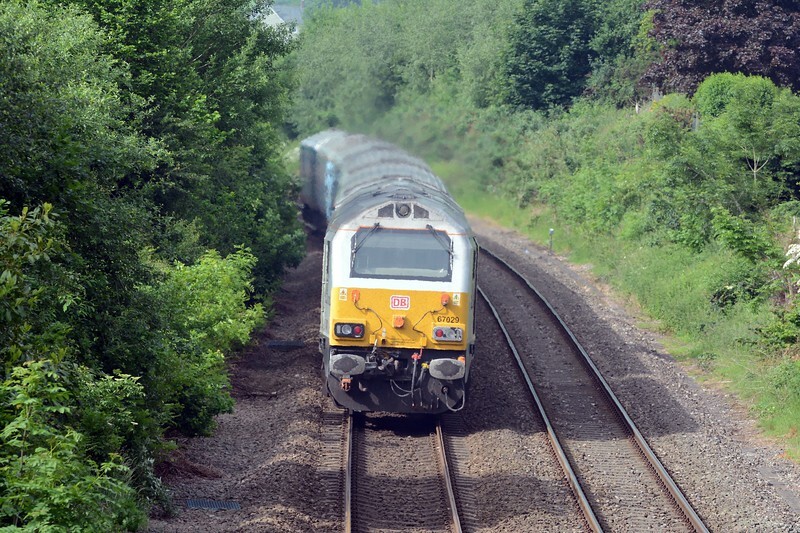 On Mid Summer's Day it was a shade cooler, only 28C, when I shot a late running 6M86 at Ponthir before heading up to Trelewis, on the Cwmbargoed branch, for the afternoon loaded train to Port Talbot. I was back there on Friday in rather different conditions, for the lunchtime empties ascending the branch and entering the washery. Repainted DBC 66s much in evidence too. The month ended on a strange note. Firstly the Marches Line was thrown into chaos on Monday and Tuesday 26th & 27th following cable theft between Cwmbran and Abergavenny. On Friday DBC seemingly tried to run two trains from Margam to Cwmbargoed on the same schedule, eventually cancelling one after it reached Cogan and sending it back to Margam! Practising for the new rostering arrangements which come into force on Monday July 3rd? DBC's new crewing arrangements proved problematic, on a couple of days during the first week of July no trains ran to Dee Marsh, Moreton on Lugg or Cwmbargoed, hopefully just teething troubles. One outcome was that Hope Cement contracted with Freightliner for at least one trainload of coal from Cwmbargoed to Earls Sidings, resulting in 66547 reaching the mine on Friday 7th. That wasn't entirely trouble free, a brake pipe needed replacing on one of the hoppers so the departure back to Margam was some 80 minutes late, but at least they got their coal. Over the following weeks Freightliner operated another Cwmbargoed to Earls Sidings train as well as providing locomotive, crew and wagons to DBS for the 4C95 / 6C95 working from Margam to Cwmbargoed and back, which the new DBC roster appeared unable to cover reliably. They also took over the 6M86 / 6V80 Margam to Dee Marsh steel. Week commencing 24th July brought a newcomer to the Marches Line, albeit temporarily. The Colas operated 6M50 Westbury to Bescot, diverted from its normal route through Oxford by the week long blockade. The first and second week of August were very mixed, some sun but plenty of cloud and rain too as fronts paraded across Wales off the Atlantic. A brief respite on Thursday 10th saw me at Onllwyn and up at Cwmbargoed for coal workings and Saturday 12th was marked by a visit to Park Junction for a Machen to Westbury stone working. On Thursday 17th I spent the day in and around Manchester, riding on Arriva Trains Wales direct from Abergavenny. A long day which started with a visit to Penpergwm for the diverted Avonmouth to Clitheroe cement, before retracing my steps to Abergavenny station and a bacon butty in the Whistlestop caff. It was certainly worth while, I'd not been to Manchester since the summer of 2003, and the weather (and most of the trains) played ball too! The final week of the month was spent in and around Abergavenny and its environs. Traffic on the Marches Line picked up with the start of Freightliner hauled coal from Portbury to Fiddlers Ferry, two trains per day, five days a week which should see us through the autumn and winter. When I checked Realtimetrains for any activity on the Marches Line I found the 6V51 TThSO Warrington Arpley to Portbury Docks empty car transporters was running almost two and a half hours late. Great. So down to Llanvihangel I went at about 08:15, expecting it sometime between 08:30 and 08:45. But by now it was almost three hours late, only arriving in Hereford at 08:37. And there it sat to allow both a Manchester to Carmarthen and the 1V91 Holyhead to Cardiff Express to overtake. And here's the Express with 67029 pushing. The hot exhaust distorts the perspective.